Lindsey Vonn rebounded from a injured knee to finish 13th in a combined event on Sunday (Getty Images/Agence Zoom-Alexis Boichard). Vail’s Lindsey Vonn rebounded from a hairline fracture in her left knee that she sustained in a crash Saturday to finish 13th in a combined event on Sunday in Soldeu-El Tartar, Andorra, building her overall World Cup lead over Switzerland’s Lara Gut, who failed to finish the race. Eagle-Vail’s Mikaela Shiffrin continued her remarkable comeback from a knee injury in December, finishing eighth in the first combined event of her World Cup career. 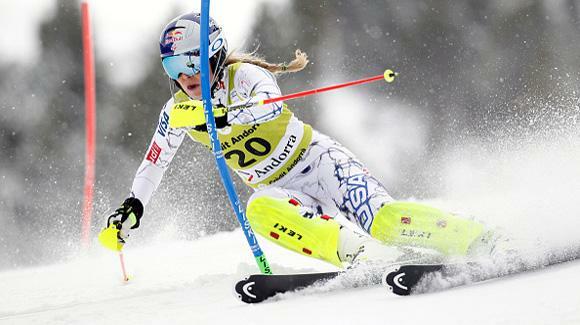 The dominant slalom skier was 40th after the morning super-G, in which Vonn posted the fastest time, but fourth in the afternoon slalom for an overall eighth-place finish. Canada’s Marie-Michele Gagnon won the event – her second career World Cup victory. Vonn was scheduled to have another MRI on Sunday and will continue to drain the knee, which is swelling up with blood and fluid. Vonn wore braces on both knees and led the competition after the super-G but only managed 23rd in the slalom, which is not a strength for the speed specialist. Gut straddled a gate in the slalom and didn’t finish, allowing four-time overall champion Vonn to extend her lead to a slim 28 points.